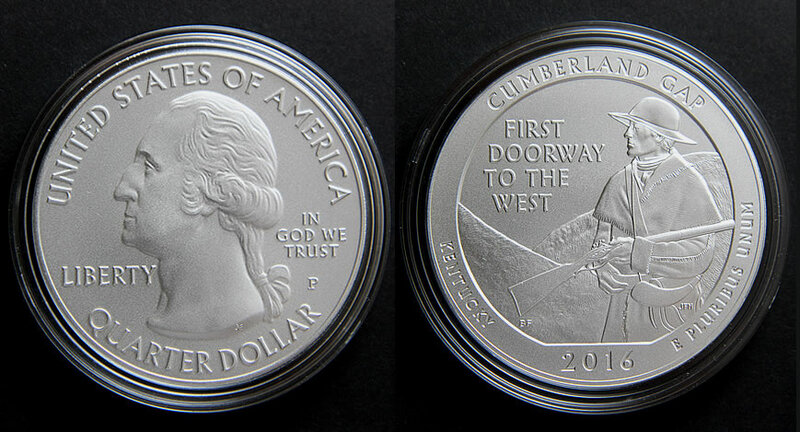 The U.S. Mint last week introduced two collectibles commemorating Cumberland Gap National Historical Park. Sales of both opened a bit weaker than their sister products released earlier in the year. Kicking last week off, the 2016 Cumberland Gap Quarters Three-Coin Set debuted on Monday, May 2, for $9.95. We now know the set logged opening 7-day sales of 9,638. In contrast, the previous set with three 2016 Shawnee National Forest quarters posted sales of 10,086 over the same number of days — the second quickest start in the series in about four years. Both new products were, as expected, top sellers for the Mint. The U.S. Mint published sales updates to 219 numismatic products. One hundred and nine of them outperformed their prior weekly sales compared to 63 previously. Three of them increased by more than 1,000 units compared to 4 previously. Seven had their sales reduced compared to 6 previously. For a second week in a row, sales retreated for the 2016-W Mercury Dime Centennial Gold Coin. The 24-karat gold coin was available for about 40 minutes into its launch on April 21 before going off-sale. Last week’s sales report pulled the dime’s tally down by 2,590 to 119,920 coins. After further consolidating — taking into account returns, cancellations, etc., this week’s report showed its total down another 1,179 to 118,741 coins, or 95% of the possible 125,000. The Mint has not yet announced when/how it will sell the remaining 6,259 coins. Below are tables showing the latest sales for U.S. Mint numismatic products. The sales period covers May 2 to 8. Products with an asterisk (*) are no longer available. Did you receive your gold Winged Liberty Head dimes yet? Would love to see some of your high-quality pics to compare quality of the coins. Unbelievable that the Mint only sold 95 percent of the gold dimes! I think they are waiting to offer them later to give dealers & flippers a chance to sell all they have first. 10 per household limit was absurd for such a highly-anticipated coin. Hopefully the Mint will learn a lesson from this latest debacle & do better on the next two centennial gold coins. I finally caught up with the coins. The chase was elusive. They arrived the day after we left for an unexpected out-of-state funeral. After spending a few days with family in the Upper Midwest, most of the “crew” from CoinNews took time off for a pre-planned vacation in and around the U.S. and British Virgin Islands. We’ve just returned. I should have photos of the gold dime out by Friday. I don’t own any of the Five-Ounce coins. I should pick one up. Thanks! Did you pick up any of those BVI titanium collector coins while down there? Seth, ironically, I read about the new 90th birthday coins for Queen Elizabeth II on the day we left for St. Thomas. I snapped my fingers about that. The titanium coins would have been interesting too. I have a sense it’d be easier picking them up online. BTW, I took dozens of the gold dime photos last night. I’m not real happy with them — it’s hard to get decent shots with the dime so small. I swapped to a macro lens and took a bunch more this morning. They’re much more representative of what the coin actually looks like. I’ll probably publish those on Monday, however.